This is where many things begin, with Steve Biko. Steve Biko was unwilling to compromise if it would in any way maintain the status quo of “normalisation” of a racist paradigm. He was a man who believed in the power of self-liberation by the means of empowerment that historically was called “Black Consciousness”. Far from being a racist idea, it was instead inspired by the awareness that a human could only achieve his freedoms by refusing to submit and surrender to being a lesser human being. Defining the needs of his own people and expressing the perception of these needs without a filter of what in his time was known as “the white liberal”, Biko insisted upon the task of the white man resolving his racism problems and the black man becoming aware of his own potential and needs, translating them into action. A slogan that he coined: “Black Man, you are on your own” was the expression of the reality that no one else would, could or should liberate anyone else. It was a statement of empowerment and the natural result of knowing for oneself what was best for oneself, and it included the realisation that leadership could only come from within, the grassroots could only be built by establishment of the primacy of the needs of the group and actions decided upon as an outcome of internal consensus. And this is why Steve Biko is the guiding light and inspiration of this new collective effort that adapts the name of the collection of his writings and interviews. When Biko wrote under the name “Frank Talk” he was not directing his discourse at the world, but at the world that could gain from his thoughts to change the status quo, could learn from his insights and could engage in a discourse based on common goals. 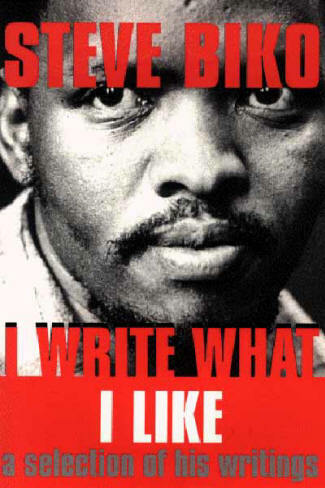 His writing was directed to his fellow South Africans who rejected the negative label of “non-whites” – identifying them by what they were “not” and instead replacing it with a strong awareness of what Blackness was and how awareness of the Black Identity was the instrument leading to liberation. Not only did he seek liberation from oppression, but he sought a just society. His discourse was based on Liberation Strategy, but it did not stop with the liberation of Blacks from the chains of apartheid, but extended towards a vision of equality and prosperity for all South Africans, and the emergence of an paradigm for liberation that could possibly be extended to any part of the world where there was colonialism, oppression and racism. We see a completely non-racial society. We don’t believe, for instance, in the so-called guarantees for minority rights, because guaranteeing minority rights implies the recognition of portions of the community on a race basis. We believe that in our country there shall be no minority, there shall be no majority, just the people. And those people will have the same status before the law and they will have the same political rights before the law. So in a sense it will be a completely non-racial egalitarian society. … We don’t need any artificial majorities, any artificial laws to entrench ourselves in power because we believe once we come into power our sheer numbers will maintain us there. We do not have the same fear that the minority white government has been having all along, which has led to his many laws designed to keep him there. – Steve Biko “No Timetable” in Our Strategy for Liberation. The vision of the future based on equality is one that nevertheless acknowledged human diversity and the differences in treatment that are part of all colonialisms (and occupations). Black Consciousness is in essence the realisation by the black man of the need to rally together with his brothers around the cause of their operation – the blackness of their skin – and to operate as a group in order to rid themselves of the shakles that bind them to perpetual servitude. It seeks to demonstrate the lie that black is an aberration from the ‘normal’ which is white. It is a manifestation of a new realisation that by seeking to run away from themselves and to emulate the white man, blacks are insulting the intelligence of whoever created them black. Black Consciousness, therefore, takes cognizance of the deliberateness of God’s plan in creating black people black. It seeks to infuse the black community with a new-found pride in themselves, their efforts, their value systems, their culture, their religion and their outlook to life. And thus, it should not be a surprise that our inspiration is Steve Biko. We are living in times of people taking charge of their own struggles for liberation against tyranny. The Tunisian spark that is freeing all the people of North Africa and which will continue to be a trend towards the freedom of the region and ultimately beyond has been for us a monumental event of historical importance and also… joy. We support the people’s struggles everywhere, and know they will eventually be victorious. This blog seeks to be a space for discourse about the liberation struggle FOR those in the struggle in what was called in an orientalist moment “The Middle East” and for those who support it from the outside. We wish to address this public, the public of Palestinians and ‘solidarity activists’ for Palestinian freedom as well as all the “Middle Eastern” liberation struggles, and our aspirations are to add anything possible to lead to liberation by means of improving our strategy, defining our instruments and using them wisely, working with one another to keep a vibrant, varied, interesting and effective discourse which leads to more and more actions that bring about the end of all the occupations and the true expression of the vast potential in the concept of “Arabhood”. In that sense, it is an internal discourse, as Palestinians don’t need to be told how bad Israel is. This is an undisputed fact. It is more effective to abandon time-consuming rhetoric amongst those in the movement who in one sense are doing great work, and are completely determined with their hearts and minds to expose Israeli crimes, but whose efforts sometimes seem like singing to the choir – and instead to devote our energies to refining our own strategies and supporting our own grassroots movements in carrying out a variety of effective actions. We are convinced that Israel has no fear of rhetoric, indeed, the presence of hyperbole can be counter-effective as it often allows them to “prove how everyone hates them” and grants them a sort of excuse to further entrench themselves in the garrison mentality that they express in obscene violence and oppression of those they perceive as “the enemy”. We are further convinced that the real tool to liberate Palestine is the UNITY of all Palestinians, across all geographic, social, religious divides. The Palestinian People, united in the Arab Body is the true and legitimate tool towards liberation, just as all the Arab peoples are throwing off shakles of tutelage and tyranny (some more effectively than others). We know there is a limit to how much Israel can do. Their days are up, their fate is sealed. It is just a matter of tactics, of adopting good strategy and unity of purpose… and like Biko suggested, it was impossible to know exactly when it would happen, but the liberation is inevitable, it is perhaps on the horizon. 7) each person is accountable for their actions and deeds. This means that we have a duty to uphold the principles that we are convinced are driven by justice, but we are going to also have our own personal and individual differences that we also uphold and defend. We believe in the necessity for unity and reconciliation, but we also believe that it does not imply homolgation to a single ideal or vision, whether it be political or religious. Thus, each writer and contributor here recognises his or her unique individuality and personal voice. We each speak for ourselves, as individuals seeking to engage with others in fruitful discussion. Yet, we seek to also speak and act collectively in the times this will be strategically beneficial. This site takes off where Palestine Think Tank left off and it intends upon maintaining now, (as then) the primacy on the Arab Voice of Resistance. We hope that the creation of a larger collective in a format where others can contribute with greater ease will serve the cause, and we hope that discourse is positive, enlightening and civil. And we want nothing but FRANK TALK.